This is shot from the Queen Street Car. 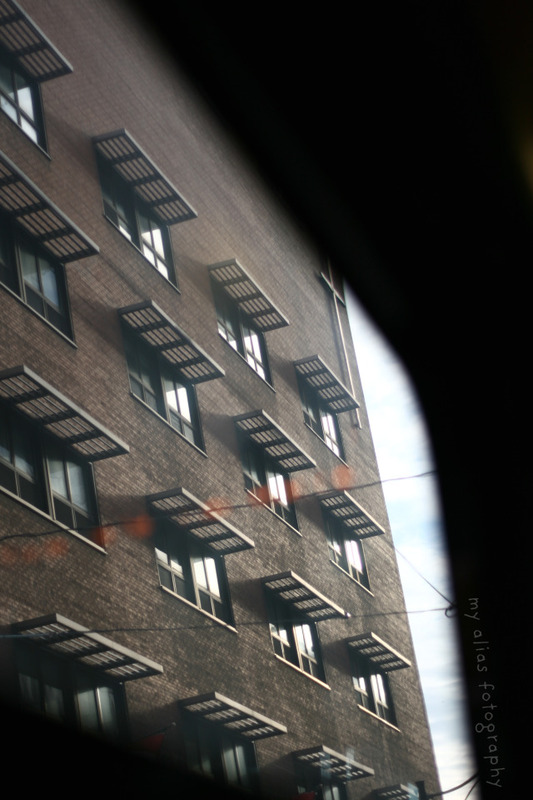 I think this building is St. Mikes – as seen from the window of the street car. Just could not pass up the light! ~And the day went by rather quickly despite being overtired, after a busy weekend of shooting. I rented the Canon 5DMkII. This is one review of it. I had been drooling over this camera for months. Dreaming of the day I’d get to own one, and you know what? Not so impressed. I was expecting AMAZING results – as compared to my Canon 50D, which was the camera one step below the 5D, until Canon recently introduced the 7D. I have yet to ‘study’ my ‘field test’ [I took both camera’s to the shoots and used them with all the lenses] – but my initial feeling is that I can get pretty close to similar results using my 50D [by taking time to think and learn how the 50D operates best] and the right lens combination, like the 135mm f2.0, prime lens [fixed focal length], which I am now in love with :-) Instead of shelling out money for both the 5D [$3k] AND an L series lens [$1k and up], as my current EFS lenses, don’t fit this body, I could just [when that money miraculously appears] buy the 135mm f2 and get pretty stellar results. I wish I had learned this sooner. I’m not saying that the 5DMkII isn’t an awesome camera [and it’s especially awesome with the 135mmf2], just that I wished that I had not focused on what I didn’t have but had rather used what I DID have to it’s best ability. Lesson learned.